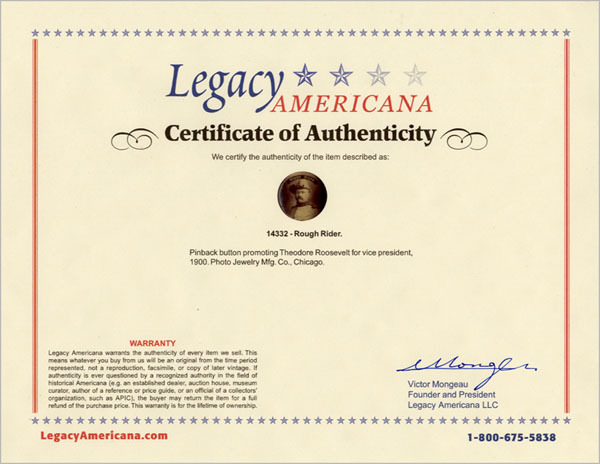 Certificate affirming our lifetime Warranty of Authenticity for any item purchased from Legacy Americana. Certificate will show the item, contain a brief text description, and will be signed by our company president. Note: If you are buying more than one item and wish to have a certificate for each, make sure to order the correct number of certificates. If you want certificates issued for some items but not others, please indicate which; otherwise, we will issue certificates based on value, starting with the highest priced item. If ordering certificate(s) for item(s) previously purchased, indicate in note field using our catalog number(s), or contact Customer Support.